A musical extravaganza took place at the Glasgow Royal Concert Hall on Sunday 1st June 2014 for the Voices of the Commonwealth concert where the Scottish massed Male Voice Choir performed alongside Choristers and Choirs from Australia, Canada, England, Wales and Northern Ireland for a pre-Games concert to raise money for Alzheimer Scotland. This gala evening was introduced by Jamie McDougal and featured performances by Gordon Cree. Cheryl Forbes, The Swingcats, The Scottish Police , Glasgow Division Pipe Band , The Kirkintilloch Band and a special appearance of Jai McDowall. 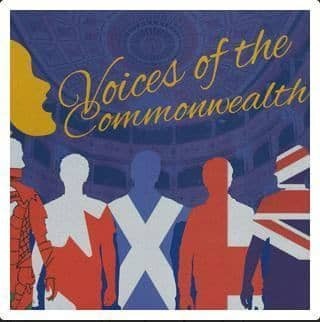 Voices of the Commonwealth was the brainchild of Glasgow Philharmonic Male Voice Choir musical director William Barr. Members of the Aeolian Male Voice choir started rehearsing for the event during October 2013 and participated in a number of rehearsals which took place in Tannochside & Glasgow.The event itself was a wonderful occasion helping to raise funds for a worthy cause. On Saturday we had a lunch to celebrate the handover of the proceeds of the concert to Alzheimer Scotland. Present was Jim Milligan, secretary, Angus Simpson, William Barr, Musical Director and Arlene Crocket, deputy director Glasgow Alzheimer Scotland. Sadly Rachel Laming, Treasurer could not attend as it was her birthday and and her fiancé had surprised her with a special day out in Bute. Thanks to your support a cheque for £11,000 was handed over.